CatMaster Tackle Suspended Worm/Leech Rig "The Orginal"
Designed to fish leeches or worms surface or sub-surface, also known as the "SS Rig"
Complete with instructions & diagram. During lengthy field testing, catfish to over 80lb have been caught on this rig in the UK. Our own Pellet hook tied with 70kg Dyneema. The hair is 60cm long & left for you to tie off so that you can easily thread those pellets on, the hooklength is 150cm long. The hook has 10 turns round the shank and the swivel has 5 turns to ensure a strong & secure knots. Use either as a straight long hair or tie in a loop to create the neckless rig. This rig has been used with devistating effect on the rivers in Spain, Italy & France with cats to over 220lb being caught. Our own Pellet hook tied with 100kg Dyneema. Designed to be fished either with the Buoy method or under a float fished from a boat. Constructed with 220lb Dyneema, Eagle Wave Hooks. 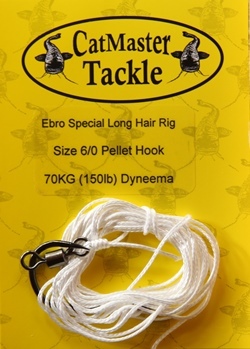 Can be used as a double hook rig where each hook is attached to your bait or can be used as a flying hook rig where only the top hook is attached to your bait and the bottom hook is left totally free. The majority of hook holds will be on this flying hook. For use where double hooks are allowed to be used. Constructed with 100kg (220lb) Dyneema, Eagle Wave Hooks. 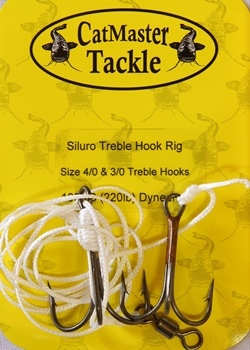 For use where triple hooks are allowed to be used. 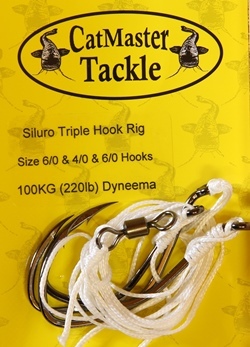 Constructed with 100kg (220lb) Dyneema; Treble Hooks. 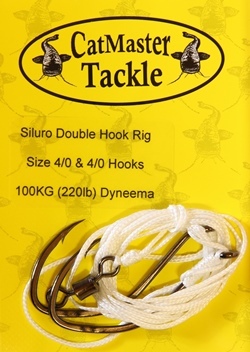 Can be used as a double hook rig where each hook is attached to your bait. Devloped by Stefan SeuB for vertical angling from the boat. Allowing livebaits or deadbaits to be tantalisingly presented. The rig is retrived in permanet contact with the bottom. One of the most succesful methods for tempting catfish during the colder months, when catfish are resting. Particularly suited to the rivers Po, Ebro, Rhine and the river Rhone. 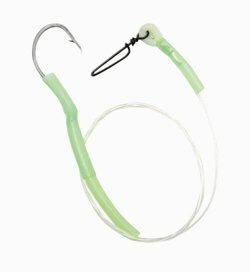 Prevents the lure from tangling on the cast and protects against biting. A special mono rig designed for Eels. Constructed with 150lb Black Cat Mono Leader, 8/0 Black Cat Catfish Hook & a 250lb Black Cat Crosslock swivel. A special protective wallet for catfish rigs. All rigs are stored in a plastic sleve, protected against dirt & water. 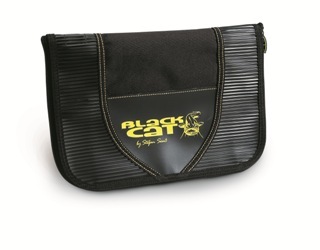 As with all the other items in the Black Cat range this item is very robust.